The mountains of Baikalia and Transbaikalia occupy a vast area between 51-57°N and 100-125°E, extending for nearly 2000 km from west to east. They are limited by the Lena-Angarsk plateau in the north and by the Mongolian border in the south. They are separated from the Eastern Sayan in the west by the Tunkin graben and from the Amur region in the east by the Olekma river. The mountains extend in meridional and submeridional ridges (Figure 14.8) with altitudes ranging from approximately 3000 m (the Kodar Ridge) to 200-400 m in the lower courses of the Shilka and Argun. The whole area is traditionally subdivided into the Baikalia and Transbaikalia. Baikalia includes the Primorsky and Baikal Ridges which comprise the so-called western Baikalia; Khamar-Daban mountains (southern Baikalia); and Ulan-Burgasy, Ikatsk, and Barguzin Ridges which form eastern Baikalia. Transbaikalia is subdivided into western (the Vitim tableland); central which extends from the Dahurian Ridge in the south-west to the Olekma river in the north-east; and eastern including the low mountains in the basins of the Shilka and Argun. The southern part of Transbaikalia is also known as Dahuria. The Yablonovoy Ridge in central Transbaikalia forms a divide between the basins of the Arctic and Pacific Oceans and is an important biogeographical boundary. More detailed regional models distinguish two other entities: the Stanovoy upland, which extends between the northern tip of the Baikal and the Olekma and includes the Upper Angarsk, Delyun-Uran, Northern Muisk, Southern Mulsk, Kodar, Udokan, and Kalar Ridges; and the northern Baikalian uplands which comprise three elevated tablelands separated by valleys that coincide with tectonic faults: North Baikalsk, Patomsk, and Olekma-Chara. The climate of the Baikalian and Transbaikalian mountains is highly continental with extremely large seasonal temperature fluctuations and moderate or small amounts of precipitation (Figure 14.8). Most of the area is underlain by permafrost. Broadly similar climatic conditions became established in the region at the end of the Pliocene, when strong climatic cooling occurred and heat-demanding savannah vegetation was replaced by boreal vegetation. The main characteristics of the contemporary landscapes have been determined by the events of the last 2 million years or so (Belova, 1983; Isaeva et al., 1993). The paleoclimatic history of the region is best reconstructed from the sedimentary record of Lake Baikal which is uninterrupted by the Pleistocene ice sheets and spans the last 20 million years. Many Russian and international scientific teams have been researching the Baikal record and their results are discussed below. This section briefly examines environmental change in the mountainous regions in the late Pleistocene. The evidence for past changes has been obtained mainly in the mountains of Baikalia, western Transbaikalia, and in the northern Baikalian and Stanovoy uplands. This section is based on the summaries by Belova (1983) and Isaeva et al. (1993). 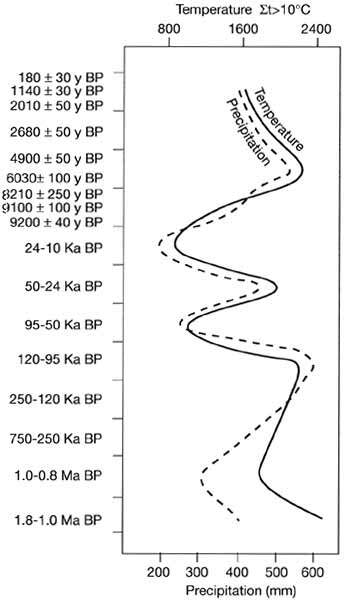 The late Peistocene (120-10 Ka BP) includes four intervals that correlate with the Kazantsevsky and Karginsky interglacials and Zyranka and Sartan glacials (Table 2.1). 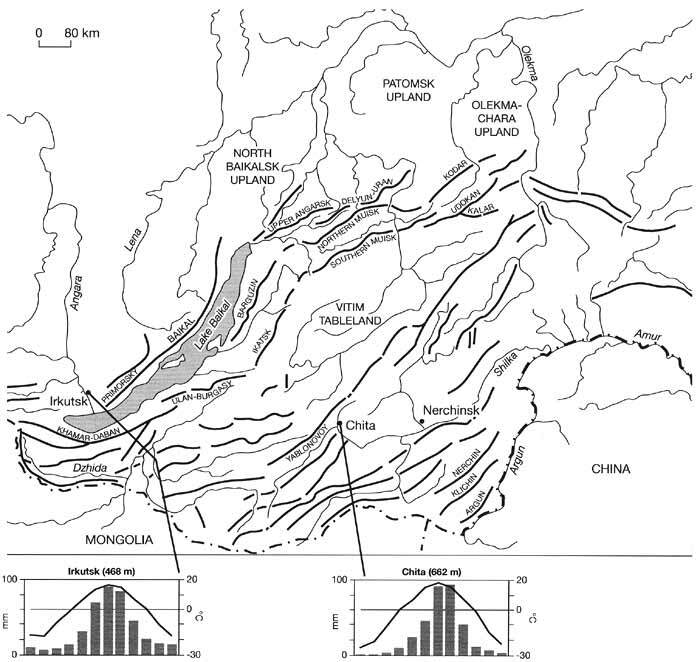 Deposits of the Kazantevsky interglacial (120-95 Ka BP) are represented mainly by alluvial and lacustrine sediments which fill the intermontane depressions and form river terraces. In the North Baikalsk upland, the pollen record of the optimum of the Kazantsevsky interstadial shows Pinus sibirica and Pinus sylvestris, some Abies sibirica and Picea obovata, and in most favourable habitats Tilia and Corylus avellana (Rindzyunskaya and Pakhomov, 1977). Broad-leaved species occurred in many valleys from the Tunkin in the south-west to the Chara in the north-east; Quercus mongolica and Corylus avellana featured as an admixture in pine forests and in the forest-steppe zone in western Transbaikalia. On the other hand, pollen records in the Baikalian mountains have revealed a high (70-90 per cent) proportion of cold-tolerant tree species such as Pinus sylvestris, Picea obovata and Betula. The general sequence of vegetation development during the Kasantsevsky interglacial has been summarized by Isaeva et al. (1993) who propose the following pattern: (I) at the beginning of the interglacial sparse Pinus sylvestris and Larix-Pinus sylvestris forests dominated, indicating that climatic conditions were similar to those of today; (II) during the optimum, temperatures appear to have been higher than those of the present with the frost-free period reaching 130-145 days; precipitation was more abundant and dark coniferous forests with the participation of broad-leaved species spread north of the Baikal; (III) towards the end of the interstadial, following the deterioration of climatic conditions, a reduction in thermophilous genera occurred, and there was a return to boreal forests dominated by Pinus sylvestris, Betula, and Alnus. Glacial and fluvioglacial deposits of the Zyranka stadial (95-50 Ka BP) and moraines dated to that time are widespread in the northern Baikalian uplands and in the Baikalian mountains. The extent of deposits and the variety of glacial landforms significantly exceed those of the Sartan time (with the exception of the Barguzin and Ungdar Ridges where the Zyryanka and Sartan glaciers occupied approximately the same areas) implying that the ice reached its maximum distribution in the late Pleistocene. The glaciation was of a mountain valley type and the position of terminal moraines indicates that glaciers descended to an altitude 1000 m in the mountains of Baikalia and 400 m in the Vitim upland. There are geomorphological indications that the Zyryanka glaciation was interrupted by phases of less severe climate and less intense glacial activity producing terraces of different levels, containing Zyryanka alluvium, and allowing a number of terminal moraines to develop. However, no deposits that could be confidently attributed to an interstadial have been obtained yet and in their absence it is obviously impossible to reconstruct a precise sequence of events. In periglacial regions of the North Baikalsk upland, the pollen record is dominated by Lycopodium pungens and L. alpinum, characteristic of swamped habitats, and there are also Betula папа and Alnus. This suggests that at the beginning of the glacial, to which this record is dated, the vegetation was dominated by sparse forests alternating with swampy tundra. In the Barguzin Ridge, the pollen record dated to the glacial maximum, reveals the existence of tundra-steppe vegetation with the participation of dwarf birch and Artemisia. The climate of the Zyryanka was more humid and less severe than that of the Sartan. The annual precipitation totals ranged between 250-300 mm, mean January temperature was about -35°C, mean July temperature was about 10-15°C and the frost-free season lasted about 50 days (Figure 14.9). Transbaikalia and the participation of Larix gmelinii (in older texts this species is referred to as L. dahurica) increased. During the following warm stage (30-22 Ka BP), the forest-steppe associations became widespread and steppe vegetation developed south of the river Selenga. It was at that time that Larix gmelinii, the most common modern woody species in Transbaikalia, became a significant component of the forest-steppe. In all, the Karginsky flora contained about 180 species including the Arctic species which survived from the Zyranka glacial and heat-demanding broad-leaved trees which are not found in Baikalia and Transbaikalia at present. The composition of the Karginsky vegetation indicates that climatic continentality and aridity have increased in comparison with the Kazantsevsky interglacial. The frost-free period continued for 120-130 days and annual precipitation totals ranged between 300 mm in the south-east and 500 mm in the north. The Sartan (24-10 Ka BP) was marked by the expansion of glaciers, particularly in the following mounatinous regions: the North Baikalsk upland, the southern Patomsk upland, mountains of Baikalia (especially the Barguzin and Ungdar Ridges), the Stanovoy upland (especially the Upper Angarsk Ridge), at the junction of the Northern Muisk and Delyun-Uran Ridges and in the Southern Muisk Ridge. Different types of glaciers developed in the northern Baikalian and Stanovoy uplands and in the Baikalian mountains. In the Barguzin and Ungdar Ridges, open to the westerly flow and the local winds from Lake Baikal, mountain valley glaciers dominated and cirque glaciers also developed. The cirque floors are positioned at about 1400 m while valley glaciers descended lower to an altitude of 600-700 m reaching a length of 100 km. They often filled small intermontane depressions, forming ice reservoirs. Along the western slopes of the Barguzin, and especially the Undgar, they reached into the foothills, forming a piedmont glacier. The western foothills of the Barguzin are perhaps the only region where fluvioglacial deposits are abundant and form a hilly outwash plain. In the uplands, where climate was drier, cirque glaciers dominated and rugged alpine topography is now typical in the areas of their most widespread development. The altitude of the cirque floor was 1100-1200 m, being positioned higher at 1500-1600 m in the Patomsk upland. Glaciers were mostly restricted to the cirques and only rarely did they advance along narrow troughs forming the so-called hanging glaciers. These were relatively small glaciers with a length of about 10 km (2-4 km in the Patomsk upland). They reached the upper parts of the valleys only infrequently. Only in the northernmost Patomsk upland did the ice reach an altitude of about 1000 m, being otherwise restricted to 1400 m. The vegetation of the Sartan was of an open nature. In the periglacial areas of the Baikalian mountains, northern Baikalian and Stanovoy uplands tundra or forest-tundra with the participation of xerophilous species dominated (Fedorova et al, 1968; Rindzyunskaya and Pakhomov, 1977; Isaeva et al., 1993). Pollen of herbaceous plants (of which Artemisia was most common) and dwarf shrubs account for about 70 per cent of the spectrum, while dwarf birch (a typical tundra plant) accounts for the highest proportion of the woody plant pollen. Tundra and forest-tundra extended approximately between the latitudinal stretch of the Angara in the north-west to the upper course of the Kirenga (about 53°N; 115°E). Further south, Larix gmelinii forests of the northern taiga type developed at low elevations, while in the intermontane depressions of western Transbaikalia forest-steppe associations with Larix gmelinii occurred. The climate of the Sartan was more severe than that of the Zyryanka in accord with the development of the Siberian anticyclone. Although there were phases of milder climate, in general the mean annual temperature was about -15°C, the frost-free period lasted for 30-40 days and annual precipitation was limited to 190-200 mm. Glaciers occupied smaller areas but, in the absence of ice, the formation of permafrost was both intensive and extensive. Frost weathering and the formation of kurums proceeded intensively in southern and eastern Baikalia where cryogenic eluvium typical of the low watersheds is thought to be of Sartan age because at present a well-developed vegetation cover limits its formation. The amelioration of climate at the beginning of the Holocene was marked by the replacement of tundra and forest-tundra vegetation by sparse Pinus sylvestris and Betula forests in the Patomsk upland and mountains of Baikalia and sparse Pinus sylvestris-Pinus sibirica forests with a well-developed herbaceous cover in the North Baikalsk upland. During the Holocene climatic optimum, these were in turn replaced by dark taiga dominated by Picea obovata (Kazakevich and Reverdatto, 1972). Pinus sibirica forests developed on the watersheds of the Khamar-Daban mountains (Zubarev, 1981). Climatic fluctuations continued throughout the Holocene. The drier conditions marked the Subboreal when dark coniferous forests were widely replaced by the pine forests (Vipper and Golubeva, 1976) and colder climate was typical of the mid-Subatlantic when the timber line became markedly lower and Pinus sibirica woodlands in the middle Khamar-Daban mountains were replaced by tundra communities (Zubarev, 1981). There are few reconstructions of the climatic conditions during the last millennium and those available refer mainly to the Baikal coastal regions. An exception is a dendrochrono-logical record produced by Lovelius (1979) for the subalpine zone of the Kodar Ridge which shows that the end of the 17th century was, perhaps, the coldest time during the last thousand years. The most recent climatic warming began in the 19th century and this conclusion is supported by instrumental observations which started in Nerchinck in the middle of the 19th century (Obyazov, 1996). The modern climate of Baikalia and Transbaikalia is ultracontinental with extreme seasonal variations in temperature and a moderate or small amount of precipitation (Figure 14.8). Annual precipitation totals range between 400-500 mm in the northern uplands and 200 mm in the depressions of central and eastern Transbaikalia. The two major seasonal atmospheric controls are the Siberian anticyclone in winter and the Inner Asiatic depression in summer. The Siberian high forces sunny, dry, and extremely cold winters. The lowest temperatures of about -50°C to -60°C are observed in the Chara depression. Local topography (i.e., vast topographic depressions and uplands) intensify the development of high atmospheric pressure. In Transbaikalia, anticyclonic weather is observed on average on 25 days in January and only about 10 per cent of annual precipitation occurs between November and March. The dry cold weather can occasionally be interrupted by the advec-tion of warmer air from Central Asia (and occasionally from European Russia) to Baikalia and more rarely from the Sea of Okhotsk or China to Transbaikalia. Snow cover is thin, reaching 30-40 cm in the upper course of the Angara and 10-20 cm in the Nerchinsk depression. Snow cover increases with altitude but on the whole low temperatures and the thin snow cover favour deep freezing of soil and so maintain permafrost. In summer, a zone of low atmospheric pressure with small pressure gradients develops. While depressions arrive to Baikalia mainly from the west, Eastern Transbaikalia is affected by the Asian monsoon and receives 100-150 mm of rain in summer (mainly in its second half) compared to 75-100 mm in western and central Transbaikalia (Myachkova, 1983). Summer temperatures often reach 30°C and advection from the deserts of Mongolia and China can raise air temperature above 35°C. Across much of the southern part of the Baikalian and Transbaikalian mountains summer evaporation is close to precipitation which provides for the development of the forest-steppe vegetation. The continentality of climate is moderated by Lake Baikal although the surrounding mountains limit the geographical extent of its influence. In the coastal zone, mean January temperature is about 10°C higher than in the areas positioned at the same latitude but outside the Baikal depression and temperature inversions, one of the most typical climatic features of the region, do not develop over the lake. Although severe, the climate of the Baikal has many maritime features (e.g., autumn is warmer than spring). Because of the enclosed character of the valley, annual precipitation totals vary between 200 mm on the western coast and 400 on the eastern coast. Only the northern slope of the Khamar-Daban, which intercepts moisture delivered by depressions travelling from the north-west and regenerated over the Baikal, receives up to about 1300 mm and has a depth of snow cover of about 1 m, while the western macro-slope of the Barguzin Ridge receives about 900 mm (Myachkova, 1983). Meagre winter precipitation and hot summers do not favour modern glaciation. Glaciers with a combined area of 15 km2 develop only on the north-western macroslope of the Kodar due to the northern position of the ridge and its high elevation (maximum elevation 3000 m). The snow line is between 2200 and 2600 m and valley glaciers are small, reaching 1-2 km in length. Three main types of vegetation dominate Baikalia and Transbaikalia: taiga, forest-steppes, and steppes. Their distribution depends on geographical position and topography. Thus steppes form a zonal biome in Dahuria, extending from the Mongolian border to 53°N between the Baikal and the river Argun. However, steppes and forest-steppes also occur in the north in valleys and depressions where the climate is dry (e.g., the Barguzin valley; 55°N) while individual steppe associations are found as far north as Sakha-Yakutia. North of approximately 53°N, zonal vegetation is that of the taiga. There is a notable difference in composition of the Baikalian and Transbaikalian taiga. In Baikalia, where summer temperatures are lower and there is more precipitation, dark taiga composed mainly of Pinus sibirica and Abies sibirica is prominent. In western Transbaikalia, larch forests dominate while Pinus sibirica and Abies sibirica occur as an admixture. Eastwards of the Yablonovoy Ridge under the dry conditions and the widespread occurrence of permafrost, forests composed of Larix gmelinii and Pinus sylvestris develop and only in the east do Picea ajanensis and some deciduous species penetrate from the Amur region. Steppes and forest-steppes do not form a continuous belt in Baikalia but occur locally in locked-in valleys and on the south-facing slopes. In these habitats, steppe communities develop on the dark-chestnut and chernozem soils and comprise both steppe and meadow species. Woody vegetation in the forest-steppes is represented by Pinus sylvestris, Larix, and Betula spp. Forest-steppe vegetation is particularly widespread in the Dzhida Ridge where it reaches an altitude of 1100 m and locally 1400 m.
Baikalia and Transbaikalia are mountainous regions and zonal vegetation patterns are disrupted by vertical zonality. There are three main types of vertical sequences (Figure 14.10). A typical vertical sequence of Baikalia, western and central Transbaikalia begins with Larix sibirica and Pinus sylvestris forests which are progressively replaced by Larix gmelinii north-eastwards where permafrost is more widespread. In the south, forests are not dense and shrub and herbaceous cover are well developed. A particularly widespread association is that with Alnaster fruticosus and Rhododendron dahuricum. In the north, forests are often swamped and larch forms associations with Rhododendron dahuricum, and such cold-resistant species as Betula divaricata, B. exilis, and Ledum palustre. In contrast to the Altay and the Western Sayan, the climate of Baikalia and Transbaikalia is too harsh for the widespread development of subalpine and alpine meadows, and forests are succeeded by shrublands dominated by Pinus pumila. The growth of Pinus pumila depends on the availability of winter precipitation and the depth of snow cover. For this reason the vertical extent of this belt is irregular and locally it may be absent. Thickets of Pinus pumila are very dense and reach 2-4 m in height, providing ideal conditions for the accumulation of snow and sheltering other plants under its canopy. Mountainous tundra communities develop above and depending on the availability of moisture three main variants exist: dwarf shrub tundra, mossy tundra in wetter habitats, and lichen tundra in drier habitats. There is a very clear relationship between the orientation of the ridges towards the moisture-transporting flows and the development of vegetation. Thus, the northern macroslope of the Khamar-Daban, the western macroslopes of the Barguzin and Baikal Ridges, which receive abundant precipitation, are distinguished by the occurrence of a wide dark taiga belt. Alpine meadows, mainly composed by Kobresia bellardii communities, dominate the upper part. A typical vertical sequence in Dahuria begins with the steppe belt which in the south continues into the steppes of Mongolia. Depending on the availability of atmospheric moisture, aspect, soil texture, and drainage, different types of steppe communities develop. The so-called 'four-grass' steppes, dominated by Stipa capillata, Cleistogenes squarrosa, Festuca lenensis, and Koeleria gracilis with a ground cover of just 10-12 per cent, develop on chestnut soils in valleys and intermontane depressions. On the lower slopes, communities dominated by Aneurolepidium pseudoagropyrum develop on the leached chernozem soils, passing into steppes formed by Filifolium siblricum and then into forest-steppes. There is a notable difference between woody communities developing on the north and south-facing slopes. In the forest-steppe belt, woodlands of Larix gmelinii, Pinus sylvestris, and Betula spp. occur on the north-facing slopes while the south-facing slopes, originally occupied by the steppe communities, are largely converted into arable land. Shrublands are typical of the forest-steppe belt. In the forest belt, the north-facing slopes are covered by Larix gmelinii while Pinus sylvestris forests occur on the drier south-facing slopes. 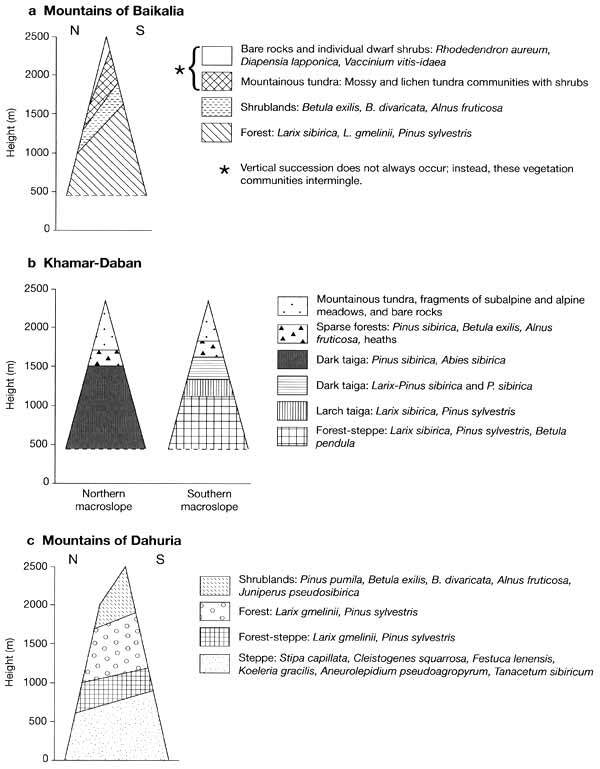 The subalpine belt has a limited extent because the mountains of Dahuria, with the exception of the Sohondo region, do not exceed 2000 m. Shrublands are distinguished by the participation of Juniperus pseudosi-birica and Caragana jubata. Meadows develop only in the Sohondo area.